Portable wifi for iPad is the ideal solution for those people who own the wireless only version of the Apple iPad. 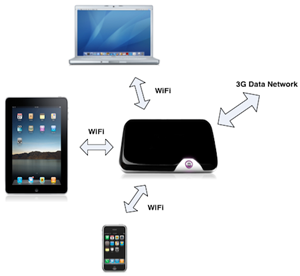 Even if you own the wireless/3g version, having your own hotspot for the iPad is not only cheaper but more convenient due to the ability to share the connection with other devices such as the iPhone which most people also carry around with them. Confused about the differences? I’ll quickly explain before moving on. The wireless only iPad can connect to wireless networks (wifi). You might have one at home or in the office but they’re not portable. The wireless/3g network can connect to a wireless network as well as a 3g networks in Australia (it’s the network your mobile phone operates on). While the wireless/3g version is great for having portable access, it can’t be shared amongst other devices! 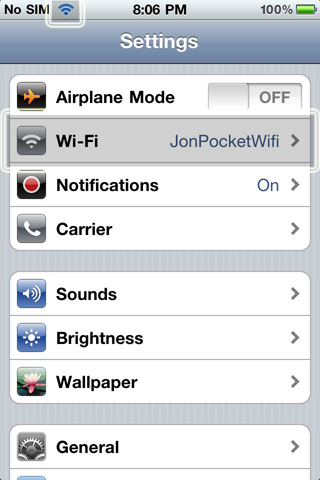 A pain if you want to use your iPhone or share the Internet with friends at a cafe or at work/uni. You can avoid all that trouble by just using the wireless function on the iPad. This will mean you can connect all your devices to the portable hotspot. Connecting to the device is really simple as well! I’ll show you how to connect to it in the following pictures (I’m using an iPhone 4 for this example but it’s the same process you follow on the iPad). 1) Select the settings tab on your iPad. 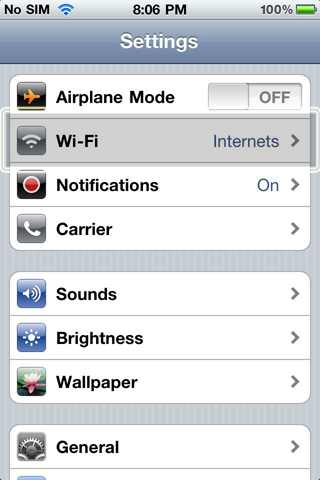 2) Next, press the Wi-Fi button as indicated in the highlighted section. 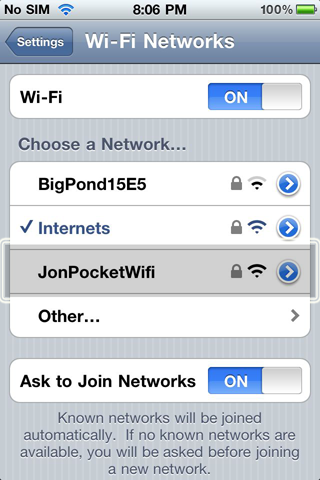 3) You will now need to select the appropriate wireless network name (my Vodafone pocket wifi is named JonPocketWifi in this example) and enter in the password to connect to the hotspot. 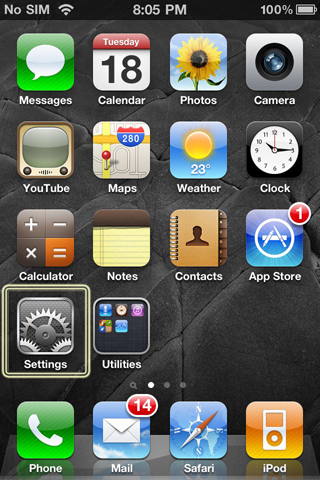 4) Hit back to confirm your iPad has connected to the correct network and that the wireless icon is displayed in the menu bar at the top. That’s it! Because the iPad and iPhone use the same operating system, it’s the exact same process. If you want to connect to your portable pocket wifi hotspot on a laptop, it’s a very similar, straight forward procedure. Now you’ll have portable wifi for iPad as well as other devices you or other people have with them. It really solves the issue of only one device being connected to the Internet and in this day and age, it’s pretty common for us to have numerous devices we need to access the Internet on. My best suggestion for portable wifi for iPad (or any other device for that matter) is the pocket wifi from Vodafone. Be sure to watch my Vodafone Pocket Wifi Review done in video. It covers off on everything you need to know about this product before making your purchase.